beauniq-19943 Beauniq 14k Yellow or White Gold 2.4mm Round Rolo Chain Necklace, 16" 18" 20" 22" 24" 30"
This necklace is made of 14k gold (not plated or filled) with a hollow structure and stamped “14K ” (585). The hollow structure allows the necklace to be lightweight and comfortable to wear, as well as be larger for a more compelling price. 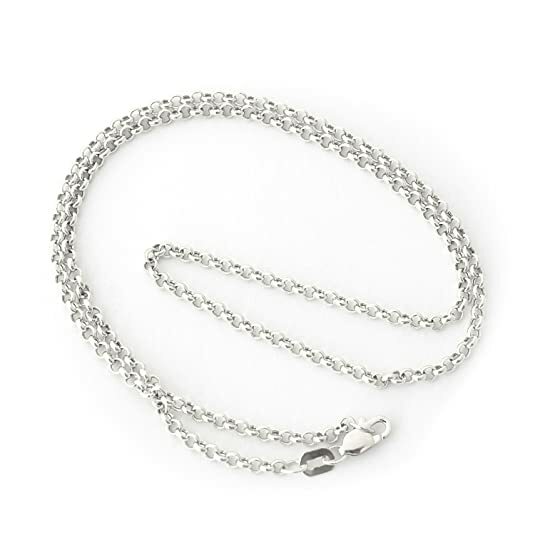 This classic necklace is a great choice for wearing with your favorite pendant.Chain is 2.4mm thick.Choosing Chain LengthUnsure what length chain to buy? 18″ is the standard length and will look great on most people. 13″ length is recommended only for small children. The 15″ length is great for small children as well, but it can also be worn as a choker on an average size adult. The 16″ length will fall just above the collarbone on an average sized adult woman, while the 18″ chain will fall just below it. A longer 20″ will likely fall just above the bust, and a 24″ chain will fall on the bust. Chains longer than 24″ will likely reach the abdomen. For best results, we do strongly recommend using a tape measure to check neck size before placing your order.About GoldPure gold (24 karat) is a very soft metal. In order to make it into durable, beautiful jewelry you can wear everyday, it is mixed with other metals to add strength. The most popular alloy of gold is 14k gold, which is 58.5 pure gold and 41.5 other metals like silver and copper. 10k gold is 41.6 pure gold and 18k gold is 75 pure gold. Adding other metals to gold also allows us to make beautiful gold variations like white and rose gold.Gold Jewelry CareTo lightly clean your gold jewelry, soak it in a bowl of mild liquid detergent and lukewarm water. Then rinse with water and dry with a soft cloth. Be careful not to bend any prongs while cleaning, as this could loosen stones from their settings. Gold is a soft metal, so we recommend storing your gold jewelry individually wrapped in soft cloth to protect it from being scratched by other jewelry or objects. beauniq-19946 Beauniq 14k Yellow or White Gold 2.4mm Round Rolo Chain Necklace, 16" 18" 20" 22" 24" 30"
This necklace is made of solid 14k gold (not plated or filled), featuring high quality cubic zirconia stones. Our cubic zirconia is bright and clear with an unmatched sparkle, so it will easily convince others it’s the real thing.Cubic zirconias measure 4mm.Choosing Chain LengthUnsure what length chain to buy? 18″ is the standard length and will look great on most people. 13″ length is recommended only for small children. The 15″ length is great for small children as well, but it can also be worn as a choker on an average size adult. The 16″ length will fall just above the collarbone on an average sized adult woman, while the 18″ chain will fall just below it. A longer 20″ will likely fall just above the bust, and a 24″ chain will fall on the bust. Chains longer than 24″ will likely reach the abdomen. For best results, we do strongly recommend using a tape measure to check neck size before placing your order.About GoldPure gold (24 karat) is a very soft metal. In order to make it into durable, beautiful jewelry you can wear everyday, it is mixed with other metals to add strength. The most popular alloy of gold is 14k gold, which is 58.5 pure gold and 41.5 other metals like silver and copper. 10k gold is 41.6 pure gold and 18k gold is 75 pure gold. Adding other metals to gold also allows us to make beautiful gold variations like white and rose gold.Gold Jewelry CareTo lightly clean your gold jewelry, soak it in a bowl of mild liquid detergent and lukewarm water. Then rinse with water and dry with a soft cloth. Be careful not to bend any prongs while cleaning, as this could loosen stones from their settings. Gold is a soft metal, so we recommend storing your gold jewelry individually wrapped in soft cloth to protect it from being scratched by other jewelry or objects. beauniq-20501 Beauniq 14k Yellow or White Gold 2.4mm Round Rolo Chain Necklace, 16" 18" 20" 22" 24" 30"
This necklace is made of solid 14k gold (not plated or filled), featuring fine quality white freshwater cultured pearls. Our freshwater cultured pearls are luminous and practically without blemish, making them look similar to pearls that fetch three times the price.Choosing Chain LengthUnsure what length chain to buy? 18″ is the standard length and will look great on most people. 13″ length is recommended only for small children. The 15″ length is great for small children as well, but it can also be worn as a choker on an average size adult. The 16″ length will fall just above the collarbone on an average sized adult woman, while the 18″ chain will fall just below it. A longer 20″ will likely fall just above the bust, and a 24″ chain will fall on the bust. Chains longer than 24″ will likely reach the abdomen. For best results, we do strongly recommend using a tape measure to check neck size before placing your order.About GoldPure gold (24 karat) is a very soft metal. In order to make it into durable, beautiful jewelry you can wear everyday, it is mixed with other metals to add strength. The most popular alloy of gold is 14k gold, which is 58.5 pure gold and 41.5 other metals like silver and copper. 10k gold is 41.6 pure gold and 18k gold is 75 pure gold. Adding other metals to gold also allows us to make beautiful gold variations like white and rose gold.Gold Jewelry CareTo lightly clean your gold jewelry, soak it in a bowl of mild liquid detergent and lukewarm water. Then rinse with water and dry with a soft cloth. Be careful not to bend any prongs while cleaning, as this could loosen stones from their settings. Gold is a soft metal, so we recommend storing your gold jewelry individually wrapped in soft cloth to protect it from being scratched by other jewelry or objects. 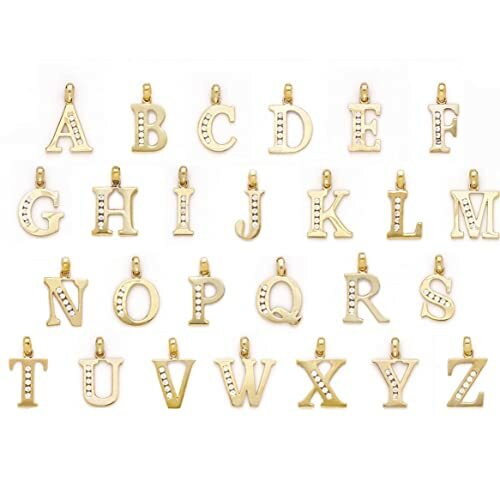 This necklace is made of solid 14k gold (not plated or filled) and stamped “14K ” (585). 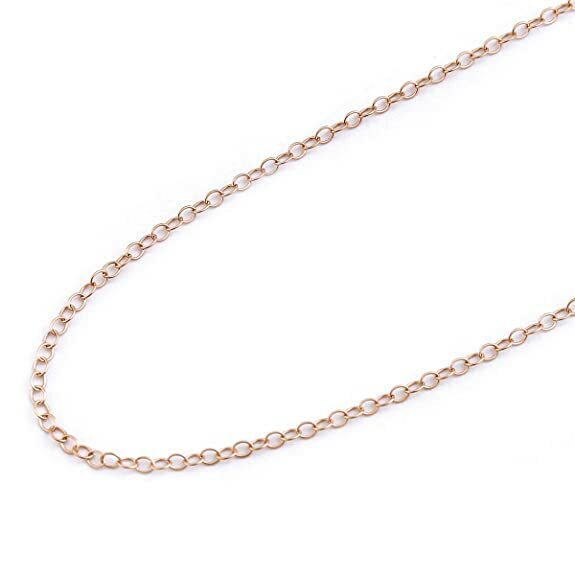 This classic necklace is a great choice for wearing with your favorite pendant.Chain is 1.5mm thick, comes in: 13, 15, 16, 18, 20, 22 inches long.Choosing Chain LengthUnsure what length chain to buy? 18″ is the standard length and will look great on most people. 13″ length is recommended only for small children. The 15″ length is great for small children as well, but it can also be worn as a choker on an average size adult. The 16″ length will fall just above the collarbone on an average sized adult woman, while the 18″ chain will fall just below it. A longer 20″ will likely fall just above the bust, and a 24″ chain will fall on the bust. Chains longer than 24″ will likely reach the abdomen. For best results, we do strongly recommend using a tape measure to check neck size before placing your order.About GoldPure gold (24 karat) is a very soft metal. In order to make it into durable, beautiful jewelry you can wear everyday, it is mixed with other metals to add strength. The most popular alloy of gold is 14k gold, which is 58.5 pure gold and 41.5 other metals like silver and copper. 10k gold is 41.6 pure gold and 18k gold is 75 pure gold. Adding other metals to gold also allows us to make beautiful gold variations like white and rose gold.Gold Jewelry CareTo lightly clean your gold jewelry, soak it in a bowl of mild liquid detergent and lukewarm water. Then rinse with water and dry with a soft cloth. Be careful not to bend any prongs while cleaning, as this could loosen stones from their settings. Gold is a soft metal, so we recommend storing your gold jewelry individually wrapped in soft cloth to protect it from being scratched by other jewelry or objects. 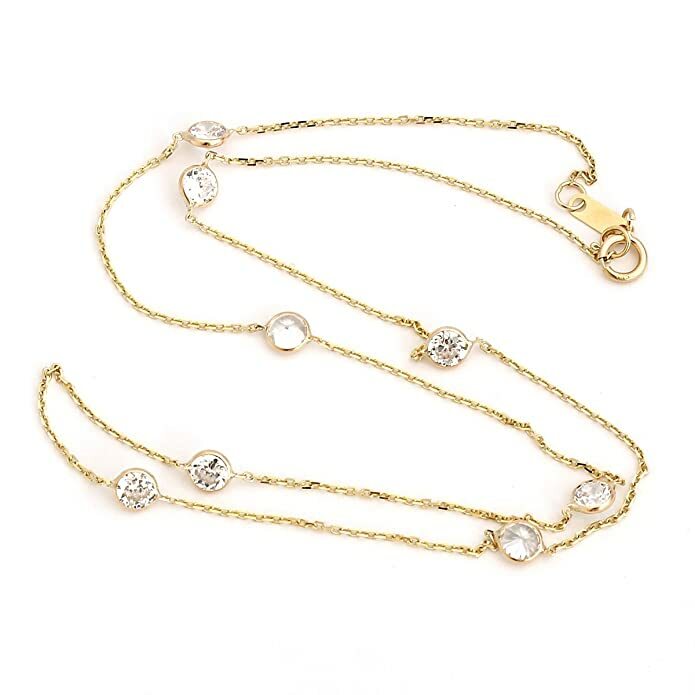 This necklace is made of solid 14k gold (not plated or filled), featuring the highest quality cubic zirconia stones. Our cubic zirconia is bright and clear with an unmatched sparkle, so it will easily convince others it’s the real thing.Cubic zirconias measure 4mm.Choosing Chain LengthUnsure what length chain to buy? 18″ is the standard length and will look great on most people. 13″ length is recommended only for small children. The 15″ length is great for small children as well, but it can also be worn as a choker on an average size adult. The 16″ length will fall just above the collarbone on an average sized adult woman, while the 18″ chain will fall just below it. A longer 20″ will likely fall just above the bust, and a 24″ chain will fall on the bust. Chains longer than 24″ will likely reach the abdomen. For best results, we do strongly recommend using a tape measure to check neck size before placing your order.About GoldPure gold (24 karat) is a very soft metal. In order to make it into durable, beautiful jewelry you can wear everyday, it is mixed with other metals to add strength. The most popular alloy of gold is 14k gold, which is 58.5 pure gold and 41.5 other metals like silver and copper. 10k gold is 41.6 pure gold and 18k gold is 75 pure gold. Adding other metals to gold also allows us to make beautiful gold variations like white and rose gold.Gold Jewelry CareTo lightly clean your gold jewelry, soak it in a bowl of mild liquid detergent and lukewarm water. Then rinse with water and dry with a soft cloth. Be careful not to bend any prongs while cleaning, as this could loosen stones from their settings. Gold is a soft metal, so we recommend storing your gold jewelry individually wrapped in soft cloth to protect it from being scratched by other jewelry or objects. beauniq-19942 Beauniq 14k Yellow or White Gold 2.4mm Round Rolo Chain Necklace, 16" 18" 20" 22" 24" 30"
This necklace is made of solid 14k gold (not plated or filled), featuring high quality cubic zirconia stones. Our cubic zirconia is bright and clear with an unmatched sparkle, so it will easily convince others it’s the real thing.Initial pendant measures (5/8 inch) 15mm tall (with the hook). Chain has spring-ring clasp.Choosing Chain LengthUnsure what length chain to buy? 18″ is the standard length and will look great on most people. 13″ length is recommended only for small children. The 15″ length is great for small children as well, but it can also be worn as a choker on an average size adult. The 16″ length will fall just above the collarbone on an average sized adult woman, while the 18″ chain will fall just below it. A longer 20″ will likely fall just above the bust, and a 24″ chain will fall on the bust. Chains longer than 24″ will likely reach the abdomen. For best results, we do strongly recommend using a tape measure to check neck size before placing your order.About GoldPure gold (24 karat) is a very soft metal. In order to make it into durable, beautiful jewelry you can wear everyday, it is mixed with other metals to add strength. The most popular alloy of gold is 14k gold, which is 58.5 pure gold and 41.5 other metals like silver and copper. 10k gold is 41.6 pure gold and 18k gold is 75 pure gold. Adding other metals to gold also allows us to make beautiful gold variations like white and rose gold.Gold Jewelry CareTo lightly clean your gold jewelry, soak it in a bowl of mild liquid detergent and lukewarm water. Then rinse with water and dry with a soft cloth. Be careful not to bend any prongs while cleaning, as this could loosen stones from their settings. Gold is a soft metal, so we recommend storing your gold jewelry individually wrapped in soft cloth to protect it from being scratched by other jewelry or objects. beauniq-8084 Beauniq 14k Yellow, White or Rose Gold 1.5mm Cable Chain, 13" 15" 16" 18" 20" 22"
This necklace is made of solid 14k gold and stamped “14K ” (585). 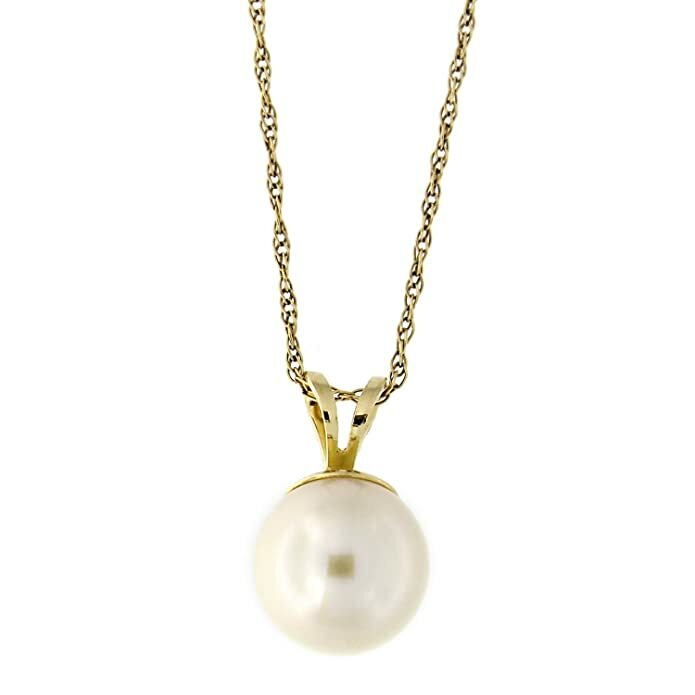 This classic necklace is perfect for everyday wear.The pendant measures 6mm (1/4 in). The chain is 0.9mm thick and is 17 inches long. 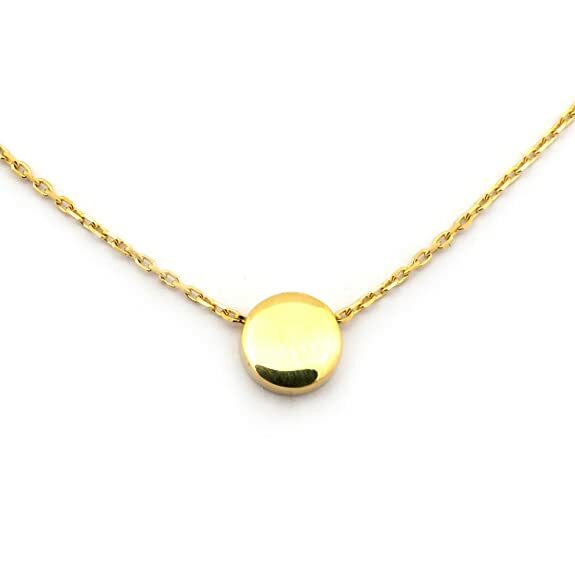 The necklace weighs 1.66g.About GoldPure gold (24 karat) is a very soft metal. In order to make it into durable, beautiful jewelry you can wear every day, it is mixed with other metals to add strength. The most popular alloy of gold is 14K gold, which is 58.5 pure gold and 41.5 other metals like silver and copper. 10k gold is 41.6 pure gold. Adding other metals to gold also allows us to make beautiful gold variations like white and rose gold.Gold Jewelry CareTo lightly clean your gold jewelry, soak it in a bowl of mild liquid detergent and lukewarm water. Then rinse with water and dry with a soft cloth. Be careful not to bend any prongs while cleaning, as this could loosen stones from their settings. Gold is a soft metal, so we recommend storing your gold jewelry individually wrapped in soft cloth to protect it from being scratched by other jewelry or objects. beauniq-19945 Beauniq 14k Yellow or White Gold 2.4mm Round Rolo Chain Necklace, 16" 18" 20" 22" 24" 30"
beauniq-19947 Beauniq 14k Yellow or White Gold 2.4mm Round Rolo Chain Necklace, 16" 18" 20" 22" 24" 30"
beauniq-19944 Beauniq 14k Yellow or White Gold 2.4mm Round Rolo Chain Necklace, 16" 18" 20" 22" 24" 30"
beauniq-14834 Beauniq 14k Yellow Gold Small Circle Pendant Necklace, 17"